Our goal is to promote a balanced use of technology and motivate our students to develop deeper conceptual understandings, ask meaningful questions and cultivate transferrable skills that they continually adapt to approach challenges in their lives today and in the future. Chatsworth runs a full 1:1 laptop program with all teachers and students from Years 4-13. Year 3 has a 1:3 class set for introductions to laptop and online use with a heavy emphasis on digital citizenship. Each of our Early Years classrooms at Orchard contain a learning centre comprised of no less than two Apple iMacs with full multimedia capabilities (eg. headphones, microphones, software) and we have a dedicated classroom set of five iPads and iPods (20 each) that can be used by teachers to extend mobile learning. 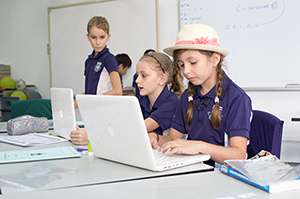 The Chatsworth Group of Schools also utilises an award-winning ePortfolio that has been presented at International conferences, and modeled for other International schools in Singapore and around South East Asia. The ePortfolios are started in Kindergarten and extend through our EYP and JYP classes. As more research and data becomes available on the role of technology in the classroom, we reflect and revisit our approach annually and adjust for trends, observations and data. In August 2016, Chatsworth implemented a new digital citizenship curriculum which will eventually be extended across all grade levels and will include participation activities and events for parents at home. All students and staff are expected to follow our Acceptable Use Policy. This policy sets the guidelines for the use of ICT equipment and Internet usage at our school and is a policy we all agree to in order to establish a mature community of ICT users. To view the Acceptable Use Policy, login as a parent/student user.